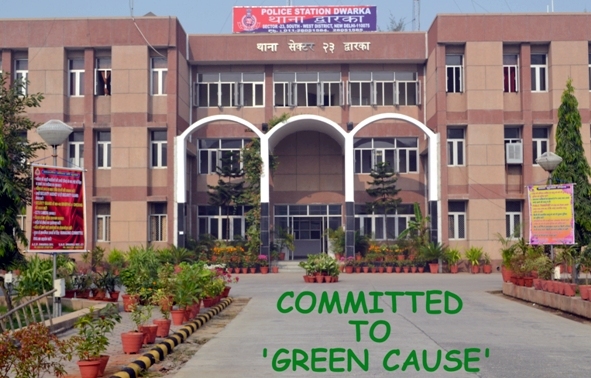 Sector 23 Police Station is Dwarka’s pride entry in race for global rank with 21 other countries including Russia & America among others through an audit of the systems and procedures to be conducted by common people of the sub-city on Sunday 6th November, 2011 under the aegis of Alma Global Alliance. P.K Datta Dwarka’s pride Green Head extended his services to DCP (SW) who readily agreed to avail his expertise in this regard. The commitment of the SW district of Delhi Police is reflected in the greenery provided with untiring efforts of SHO Bhagwan Singh and his team ably supported by the landscaping of the parks and other areas through sheer grit, determination and continuous efforts of P.K Datta. On this occasion the Dwarka Parichay team on behalf of entire Dwarka fraternity wishes best of luck to the Sec-23 Police Station team.